A home is burglarized approximately every 18 seconds, with about 30 percent of these occurring while someone was home and 7 percent resulting in a violent incident toward the resident. One way to ensure your family's safety is a home security service. Multiple studies have found a significant decrease in the likelihood you will be robbed if you have a security system. There are three basic home security service connection types that involve monitoring. The equipment involved is an important factor in deciding on a monitoring service, as each has pros and cons that affect the reliability. This type of system is installed using your phone line, or an additional phone line installed just for the system. Older systems use this technology, which has become increasingly out of date. The benefits of a landline system are that it tends to be cheaper than newer options. It also may be the only option for people who live in areas that don't have internet or cellular access. The downside to a landline system is it is the easiest of the three options for a burglar to disable. All an intruder has to do is find the phone wires going into your house and cut them, and your service will be disabled. Depending on your home, it also may involve some drilling into walls to lay a new phone wire. Installation may also require a professional service, unlike newer options you can do yourself to save money. An example of a system where you can use a landline is ADT. It's one of the oldest security companies with 140 years providing home security services. In addition to its security monitoring service, you can add options like carbon monoxide and smoke alarm detection, video, and off-site climate and lighting control. Monthly monitoring fees start at around $20 per month with a reactivated system, and $28 per month for new systems. ADT uses both landline and wireless cellular technology for their systems. Their lowest service package requires you have a landline installed although the higher priced packages do not. A broadband system works through your home's internet connection. Compared to a landline system, broadband is safer since it's harder for a thief to shut off your connection to the monitoring service. It also tends to be faster compared to a landline. Many broadband systems also allow you to set up home-based features, such as shutting off lights remotely. The downside of a broadband system is it's only as good as your internet connection. If you have consistently unreliable service from your internet provider, then you cannot count on the alarm system working 100 percent of the time, and it's best to have a landline backup. Protect America gives you the choice of using broadband for your connection as well as landline and cellular. The company has a range of pricing to meet every budget. Their lowest monthly fee is under $20 per month with the highest being under $45 per month. Pricing varies based on the number of sensors installed. All include 24/7 monitoring, and you can install the equipment yourself to save money. A cellular system uses mobile technology to send a signal to the monitoring service, making it the fastest and most reliable option. It also is the hardest for an intruder to disable. Another benefit to this system is it's generally easy to install on your own and does not require paying for additional installation help, and there is no need to install wiring. Cellular is the most expensive option of the three and like broadband, it's only as reliable as the cellular service in your area. Link Interactive uses cellular technology only, unlike other companies that allow you to use broadband, cellular, or a combination of connections. You will receive 24/7 monitoring with a simple, one-price structure of about $36 per month. For an extra $5 per month, you can add video monitoring, and there are also no installation or activation fees. You also have the option to install the system yourself, or you can purchase just their monitoring services if you have an existing system in place. 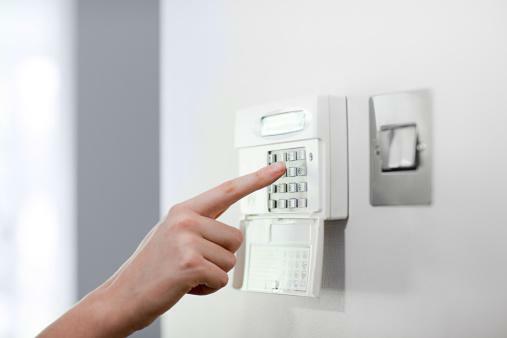 With each of the three types of installation, when the alarm is tripped by an intruder, a signal is sent to a fully staffed center that is open 24/7. The call center will contact you to confirm the signal is not a false alarm and will also contact the local police. A 24-hour monitored system can deter intruders, but having one does not mean you are safe from a break-in. Thieves may be willing to take a chance since there is a certain amount of time between when an alarm is tripped and when the police arrive, so that's a chance to steal items and leave. Another issue with monitoring is your local police department's policy on handling calls from the service. In some locales, you can incur a fine if your system has a certain number of false alarms within a specified period. False alarms can be triggered by a faulty sensor or movements against the house. Police departments may also have policies to give calls for home burglary alarms low priority. This means it may take a considerable amount of time before the police arrive, if they are able to at all, depending on what other crimes are taking place in the community at the same time. This means a thief can clear out all of your valuables with time to be long gone before the police show up. This is one of the main reasons why only 19 percent of property thefts that involve the police are solved. Remember that when you sign up for a monitoring service, you are paying for them to contact you and the police when an alarm is triggered. This unfortunately does not guarantee the police will arrive in time, and a monitoring service has no control over this factor. When choosing security services for your home, carefully research pricing, contractual obligations, and what your home owner status is in the near future. A current homeowner with no plans to move faces different needs than a renter or an owner looking to move in the near future. A monthly service fee for the actual monitoring part of the system. This cost can range from $30 to $75 per month. An activation fee is usually required at the beginning, as well. Equipment. Some companies lease the equipment to you while others allow you to buy it. If you lease, this cost will be embedded in the monthly fee cost. You will save money up front by leasing, but if you buy a system, the benefit is you can use it with a different monitoring service in the future if you so choose. Equipment can range from $250 to $700. Extra service options. The cheapest option is simple monitoring, and you can increase this cost by adding on home automation, security camera, and live video online. Other fees. Many services also charge a cancellation fee so read your contract carefully prior to signing up. Check with your home insurance companies as some will give you a discount on your policy if you have a monitored security system installed. If you rent your home, you may only be able to choose a broadband or cellular connection as you won't likely be able to make any hardware installations that affect the walls. You also should consider that as a renter, if you know you'll be moving from place to place within a few years, you may prefer a broadband or cellular system where you can bring the equipment with you to each new location and if you keep the same monitoring service, you won't have to pay any cancellation fees. There are many factors to consider when looking at your home security service options. In addition to pricing and your personal budget limits, review the contract carefully for additional fees and penalties. Ask the company about the process for alerting you when the alarm is tripped. What is their procedure if you are not reachable? Can you provide alternate phone numbers in that situation? Do they contact you or the police first in the event of an alarm, and what is their average response time between when the alarm is triggered and when the staff makes contact with the appropriate individuals? Talk with friends and neighbors who have a security monitoring system to get their feedback on their experiences. If they use broadband or cellular, ask how often they have had service disruptions due to poor internet or cellular connections. If they have had alarms tripped, how quickly did they hear from the monitoring staff? How good was the company's customer support? Check with your local police department as they can most likely give you feedback on what systems they have observed in homes, both positive and negative. Query them on how they handle calls from the monitoring service and their average response time to burglary alarm calls. If the company requires you to buy equipment, how long is the warranty and how much does it cover? Do they have staff install the equipment, or do they subcontract this out to local independent licensed contractors? If they subcontract, can you get information on who will do the work so you can get references and check their Better Business Bureau and/or state licensing board information? Do you want other features, such as live video streaming, which adds additional security? Are you willing to pay more for monitoring of smoke and carbon monoxide and home automation features? Does the company require a contract and if so, for how long? If you need to cancel, will you be charged a penalty? By fully reviewing all of your options and doing your research with the above tips, you can find a home security monitoring service that fits your needs and budget and provides an extra level of safety for you, your family, and your household possessions. You can also look at home security systems that do not involve monitoring as an alternate option. While purchasing home security monitoring can't prevent every break-in, it can go a long way toward deterring most criminals and providing an extra layer of protection. Using a fully staffed 24/7 monitoring center means someone will always be able to handle an alarm situation even if you are on vacation or unable to handle the call. This can save you from dealing with the financial and emotional pain of having your house burglarized.